“Go! Fly! 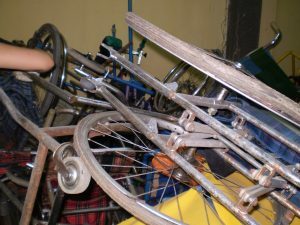 Wheelchairs” hopes that recipients will use the wheelchairs as long and comfortably as they can. Therefore, the donated wheelchairs are cleaned and maintained before we hand them over to travelers. We have maintained wheelchairs at our office since May 2015. Our veteran maintenance volunteers can carefully instruct people who have never touched a wheelchair before. 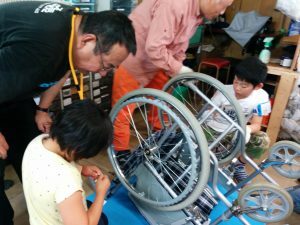 For maintenance, we also welcome the travelers who will bring wheelchairs abroad by themselves. Please contact us if you are interested in maintenance. We will always accept you whether you are alone or in a group. We hold a course to train you for this hands-on experience.